Explore effective techniques for family issues, anger, attention, grief, trauma and more! 10 new creative interventions to implement with your clients tomorrow! Join Dr. Mistie Barnes as she presents a lively, practical, experience-based seminar on a growing field of interest that will revitalize you and your work. Learn to incorporate fun and creativity with children, adolescents, and families! Learn more about play therapy, how it works and the therapeutic relationship. You will also learn methods and techniques of non-structured play therapy, a highly effective method for working with children and adolescents. Explore and learn creative, practical skills and techniques to address trauma, stress, poor coping skills, family relationships, anxiety, low self-esteem, attention and concentration and more, to effectively treat your clients, in a clinical or a school setting. By implementing and incorporating these creative techniques and interventions, you will have an opportunity to connect and develop a strong therapeutic relationship, address problem areas and teach new skills and behaviors through a medium which is less intimidating and more effective than talk therapy alone. Dr. Barnes demonstrates creative interventions and techniques, incorporates videos of real play therapy sessions, PowerPoint, and provides an opportunity to experience some of these interventions first hand. 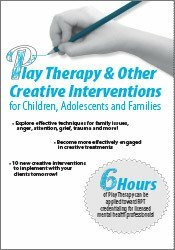 Dr. Barnes also offers practical ideas and suggestions for setting up and stocking a creatively-friendly therapy room, locating resources, and obtaining credentialing to become a registered play therapist. Identify at least 10 new creative interventions to implement with your clients tomorrow! Explain two common problems found in the play room. Describe what play therapy is, what it is not, and how to more effectively engage in creative treatments. Explain effective techniques for family issues, anger, attention, grief, trauma and more! Define uses and types of creative interventions. Identify the components of the therapeutic relationship. Dr. Mistie Barnes is a Licensed Professional Counselor-Supervisor and a Registered Play Therapist-Supervisor. She has over 12 years of experience working directly with children, adolescents, and families, and specializes in utilizing play therapy with these populations. Dr. Barnes works with a range of issues, including anxiety disorders, divorce, foster care and adoption, grief, ADHD, depression, and more, with a specialization in trauma and abuse issues. She is a professor of Counselor Education at Delta State University in Cleveland, MS. She is also the founder and director of the Delta State University Play Therapy Training Institute where she provides ongoing training in the field of play therapy to students and clinicians. Dr. Barnes also maintains a limited private practice, provides clinical consultation and supervision in counseling and play therapy, speaks nationally on play therapy and related topics, is regularly quoted and interviewed by local and regional newspapers, and has published chapters and techniques in several books. She serves on several committees with the Association for Play Therapy, serves as an Ad-Hoc Journal Reviewer for multiple peer-reviewed journals, is the current Clinical Editor for the Association for Play Therapy Mining Reports, and is President of the Mississippi Association for Play Therapy. Dr. Barnes received her Doctor of Education in Counselor Education and Supervision from Argosy University, Sarasota, her Master’s of Counselor Education and Supervision from the University of Mississippi with a concentration in Clinical Mental Health, and her Bachelor’s of Arts in English and Psychology from the University of Mississippi. Dr. Barnes went on to receive specialized training to obtain credentialing as a Registered Play Therapist and as a Registered Play Therapist-Supervisor, as well as a Board Qualified Supervisor for the state of Mississippi. PESI, Inc. is an APT Approved Provider 05-165. Successful completion of this self-study course will qualify for 6.0 Non-contact hours. Play therapy credit will not be awarded to non-mental health professionals.